Not very often our testing laboratory hosts switches. However, today is an exception because industrial switch GigaLink GL-SW-F101-08PSG-I came to our lab for testing. The model in question is intended for working in the most harsh environment with the temperature from -40 to +85°С and relative degree of humidity till 90 percent. GigaLink GL-SW-F101-08PSG-I switch has eight Fast Ethernet and two Gigabit Ethernet interfaces, one of which is a combo port. One more peculiarity of the model in question is PoE support of IEEE 802.3af/at standards with the total power equal to 320W. Okay, let’s get started! Industrial switch GigaLink GL-SW-F101-08PSG-I comes in black metal case with the following dimensions: 165x145x45 mm. The model under test is intended for mounting on the standard DIN-rail, for which a corresponding holder is placed on the rear panel. The bottom panel and both sides are not remarkable, except for a sticker with the brief information about the device. For its working GigaLink GL-SW-F101-08PSG-I switch needs an external DC adapter (which isn’t included in the box) with the following parameters: 12-40V and 1A. Power connector and ground contact are placed on the upper panel of the case. The vendor recommends using of adapter with the power not less than 320W in case of connecting PoE-devices and working with low temperatures. The front panel has eight Fast Ethernet interfaces with PoE support, LEDs indicating port condition and two Gigabit Ethernet interfaces. In addition to this, LED indicating power, sunken Reset button and the model name are placed here. Now let's have a look at the insides of the switch. The hardware platform of GIGALINK GL-SW-F101-08PSG-I industrial switch consists of three green textolite plates. Configuration of the whole switch is performed with the help of one of the additional plates, on which two big chips are placed: Serial-to-Ethernet IC+ IP210W LF controller and flash card Macronix 29LV160DBTI-70G with the capacity of 2 Mbytes. On the second plate there are two four-port PoE-injectors Microsemi PD69104B1 (under big radiators), which provide all eight user ports with power. On the main plate there are four main silicons, two of which are hidden under radiators. Only IC+ IP108A chips are accessible for review which perform functions of Ethernet transceiver, and double-purpose module IP403 LF of the same vendor. For configuring the switch via the web-interface one can use any modern browser. For access, one should enter login and password, which are equal to admin and system by default. Upon successful authentication the user is navigated to the start page of the switch, where ports status and the list of device abilities are displayed. Items of Administrator menu item allow changing login and password for the administrator, setting IP-address of the device, viewing and changing other parameters of the switch, removing all user settings, firmware upgrading and rebooting the testing model. We find it strange that there is no ability for saving current settings to the file and their further recovery. In all fairness, the specified settings are available in the web-interface of GL-SW-F101-08PSG-I model, but they are placed in Backup/Recovery group. Settings of parameters for interfaces working is performed with the help of Port Configuration item of Port Management menu group. Port Mirroring menu item of the same group allows an administrator to create SPAN-sessions for mirroring the user traffic. One can limit transmission speed of the user traffic with the help of Bandwidth Control item. We cannot consider this implementation intuitively clear. To prevent broadcast storms the administrator has to go to Broadcast Storm Control item. Industrial switch GigaLink GL-SW-F101-08PSG-I supports one of two modes of working with virtual networks: Port Based and Tag Based, switching between which is performed with the help of VLAN mode item of the VLAN Settings menu group. It’s worth noting that switching of the modes leads to removing of the user virtual networks configured before. Belonging of the transmitted user data to a particular virtual network is configured with the help of VLAN member item of the same group. We should confess that setting of the virtual networks on the switch in this particular way causes bewilderment, putting it mildly. Sometimes in modern networks one has a necessity to configure the equipment the way that provides access to a particular host or resource from different virtual networks. Corresponding setting is available in Multi to 1 Setting menu item of the same group. Unfortunately, we couldn’t discover description of this function in the user manual, but assume that with the help of Non-Association Port Setting page the administrator can isolate particular ports from each other inside one virtual network. Per Port Counter group contains the only item Port Counter that displays statistics on using ports of GigaLink GL-SW-F101-08PSG-I switch. Quality of service management is performed with the use of items of QoS Setting group. All parameters of STP (Spanning Tree Protocol) working are gathered in the Spanning Tree group. Here the administrator can select mode of STP functioning, set switch priority, configure timers for the protocol working. GigaLink GL-SW-F101-08PSG-I switch has an ability of aggregating physical ports to one logical with the use of IEEE 802.3ad technology. The corresponding setting is available in the only item Link Aggregation Settings of the Trunking group. In the current firmware version one can aggregate only the ninth and tenth ports. We hope that in the next firmware versions this restriction will be removed. Aggregating is available in static mode as well as with the use of LACP protocol, which settings are also presented here. The only thing that confused us is name of the option: Link Aggregation Algorithm. From our point of view, it would be more logical to name it Load-Balancing Method or something like this. Also name of the group itself confuses us a little bit, we think that it would be more appropriate to name it LAG. Items of DHCP Relay Agent menu group allow the administrator to configure the DHCP repeater built-in the switch. Additional settings are presented in Miscellaneous group that doesn’t have sub-items. Configuring connecting to the switch via SNMP protocol is performed with the help of SNMP Settings group that doesn’t have sub-items. That’s where we proceed to completion the review of the web-interface features of the GigaLink GL-SW-F101-08PSG-I switch and pass directly on to testing, because the command line is not intended for being used by network administrators. We decided to start this section from a security scanning procedure of the switch control module. To perform this testing we use Positive Technologies XSpider security scanner. There were five open ports discovered. The most interesting data of this test are presented below. It’s worth noting that during security testing the switch rebooted several times, so we recommend specially taking care about restricting access to the control plane of the device during network design and exploiting. Naturally we informed the vendor about this problem but to our surprise we didn’t get the assurance that it would be fixed. The next test was measuring of the switching delay. This was performed for the frames of different length with different values of the switch interfaces utilization. The diagrams for forwarding frames between the interfaces GE-GE, FE-FE and GE-FE are shown below. As one can notice from the diagrams presented above, increase of the interface utilization doesn’t lead to the significant growth of the latency, but size of the frame, obviously, directly influences the switching delay. During performing testing we discovered one more peculiarity of Gigalink GL-SW-F101-08PSG-I switch working: during increase of the Gigabit Ethernet interfaces utilization loss of the frames occurs, probably, interface controllers or switching fabric can’t manage to control it, so the switch is not non-blocking. During traffic forwarding between other interfaces the specified effect doesn’t occur. Testing of the delay and packet loss was performed with the help of hardware traffic generator IXIA. That’s where we proceed to completion testing section and pass directly to summing it all up. After testing Gigalink GL-SW-F101-08PSG-I industrial switch we had mixed feelings. On the one hand, it is a compact configuring switch with all necessary base functionality and intended for working in the most extreme conditions such as the temperature from -40 to +85°С and relative degree of humidity from 5 till 90 percent. But, on the other hand, we cannot stop feeling some incompleteness. The series of industrial switches of Gigalink product range appeared relatively recently, so we hope that in the nearest future the vendor will fix all remaining drawbacks. The strength areas of GL-SW-F101-08PSG-I switch are listed below. Unfortunately, we cannot help but mention discovered drawbacks. When this review was being written, Gigalink GL-SW-F101-08PSG-I switch price in Moscow online shops was 38500 rubles. Usually we get the equipment for testing directly from a vendor or an official distributor in the territory of the Russian Federation. Today we have an exceptional case: we have received D-Link DIR-809 A1 wireless router directly from the Chinese online store GearBest. At the time of writing this review DIR-809 is not officially sold in Russia, however, it has been available for order from online stores in other countries. The sample received was not adapted to work in the territory of the Russian Federation, so that users who also want to make an order in foreign online stores will face with some features of the equipment, which we will describe in this review. Let's get started! The first thing we noticed when we have received the parcel, - the packing exterior, neither on the box nor in the manual it has a word in Russian or in English – hieroglyphs only. In our view, a Chinese online store users should be ready for this, so we are not referring it to the disadvantages of the product. Also, despite the additional packaging of the delivery service, the box was extremely crumpled, fortunately, the equipment inside was not damaged, but it will not be suitable to use the router as a gift. Of course, this does not apply either to the quality of the online store service, which sent us the good, or to D-Link DIR-809 wireless router, but we could not help but mention the detected features. Now let's look inside the box. The case of the model has the following dimensions: 190x133x83 mm (without antenna) with weight 229 grams (without power supply adapter). The device needs an external power source (included in the box) with the following characteristics for functioning: 5V and 1А. Perhaps a few words should be told about the power supply adapter, which has a non-standard for Russia plug (Type A). Therefore, users have to purchase an additional adapter or a new power supply unit with the appropriate plug and specifications. The appropriate adapter can be purchased immediately with the goods in the online store. The front and side panels do not have anything remarkable on them apart from a ventilation grate on the front panel. A small ventilation grate is also presented on the upper panel, consisting of two parts - opaque and glossy. Also there are LEDs indicating status of the entire device as a whole, the availability of the Internet connection, status of LAN-ports, as well as wireless module status. On the rear panel there are four LAN ports and one WAN port Fast Ethernet, three non-detachable antennae, power socket and also Reset/WPS button located on it. On the bottom of the case there are a ventilation grate, four plastic legs and a sticker with brief information about the device. The electronic stuffing of D-Link DIR-809 wireless router is one green textolite card which has all essential elements located on one of its sides.The system is powered by Realtek RTL8881AN SoC. Winbond W9825G6KH-6 chip with the size of 32 Mbytes performs functions of the RAM. Support of the 2.4 GHz frequency range of wireless network segmentis performed by Realtek RTL8192ER chip with 2x2 antennae configuration. SoC is responsible for the operation of the third antenna. That is where we bring the review of the hardware platform of D-Link DIR-809 wireless router to a conclusion and pass on to examining capabilities of its software component. After the first switching on the router it is necessary to perform the initial setup of the device. The LAN-interface default address is 192.168.0.1. Unfortunately, we understand nothing in Chinese therefore we had to change at first web-interface language to make further setup. First, you need to download a language pack file from the official website of the vendor, then go to advanced settings button marked with a red box in the image below. At the time of writing this article only two language packs were available: for Portuguese and Spanish languages. At first it is required to install any language file, then to delete it. These manipulations lead to the fact that English becomes language of the web-interface of the device. Not obligatory, but extremely desirable step is firmware upgrade. The upgrade takes about one minute and doesn't require any technical experience from the user: it is only required to choose the file downloaded earlier and to upload it on the device by means of FIRMWARE item of TOOLS menu. You can ensure successful change of the firmware either via the web-interface header or via DEVICE INFO item of STATUS web-interface group. D-Link DIR-809 wireless router supports the firmware recovery mode to which the device can be transferred manually (by holding the Reset button for 15 seconds while boot) or can be transferred automatically in case of failure when updating the firmware. One can ascertain that DIR-809 is in recovery mode by slowly flashing power LED on the upper panel of the case. To recover the firmware it is necessary to connect to the LAN port of the device, assign IP-address from 192.168.0.0/24 network to the NIC and appeal by means of any modern web browser to the address 192.168.0.1. That is where we bring a review of initial setup and firmware update process to a conclusion and pass on to brief examining of its web-interface. In conclusion we will note that on the FTP server of the vendor contains the bigger quantity of firmwares and language packs, than is available for download via D-Link Web server. One can access D-Link DIR-809 wireless router web-interface using any modern browser. LAN-interface default address is 192.168.0.1. The password field will have to be left blank upon the first entry. Upon successful authentication the user will find him/herself on INTERNET page, SETUP tab by means of which it is possible to choose type of connection to a provider and specify the main settings of this connection. Advanced network settings are available in the ADVANCED NETWORK item, ADVANCED tab. EASY SETUP item, SETUP tab also allows users to make setup of connection to the Internet. Besides, here it is possible to change main parameters of a wireless network. However, to our surprise, not all options of connection are presented in this menu item. Wireless networks operation is performed by means of WIRELESS SETTINGS item, SETUP tab, and also 2.4G ADVANCED WIRELESS, 5G ADVANCED WIRELESS and WI-FI PROTECTED SETUP items. One can change IP parameters of LAN interface, and also control operation of the built-in DHCP server via NETWORK SETTINGS item, SETUP tab. Control of IPv6 protocol addresses can be managed using the same item of the same tab. By means of VIRTUAL SERVER, PORT FORWARDING and APPLICATION RULES items, ADVANCED tab the administrator can set up redirection and dynamic opening of TCP and UDP ports. The administrator can allow or deny a certain traffic on the basis of MAC addresses, IP addresses and numbers of TCP/UDP ports, and also on the basis of requested URL in HTTP. The appropriate settings are available in the MAC FILTER, WEBSITE FILTER and FIREWALL SETTINGS items, ADVANCED tab. If it is required to restrict access rate of this or that client to the Internet resources, it is necessary to use the TRAFFIC CONTROL item. One can change admin password, allow remote control of the device, control user settings, set up time synchronization and connection to DDNS providers, update a firmware, and also execute cable diagnostics by means of TOOLS tab items. It is worth noting that some time zones for Russia are incorrect. So, for example, Moscow time offset indicated +4, whereas actually Moscow has time offset +3. By means of STATUS tab items the administrator can view information about the router and its interfaces, get access to log information, study the list of connections, and also view statistical information about operation of the device. Unfortunately, sending logs to the remote Syslog-server isn't provided. The web interface of D-Link DIR-809 wireless router has the built-in help, access to which can be got using SUPPORT tab items. That is where we bring a brief review of the router web-interface to a conclusion and pass directly on to testing it. The first testing procedure we usually begin our testing section with is estimating the booting time of the device, which is a time interval starting with the moment when the power is on until the first echo reply is received through ICMP. D-Link DIR-809 wireless router boots in 21 seconds. We believe that the result is excellent. The second traditional test was a security scanning procedure, which has been carried out using Positive Technologies XSpider 7.8 utility. Scanning was carried out from the LAN-interface side. On the whole, there were three open ports discovered: TCP-80 (HTTP), UDP-67 (DHCP) and TCP-52881 (HTTP). The most interesting data of those we obtained are presented below. To be fair, it should be noted that in the course of testing D-Link DIR-809 wireless router regularly rebooted, that, in our opinion, can become a serious problem even in the home networks. The first test was performance of DIR-809 model upon performing of NAT/PAT. For loading emulation we used JPerf utility version 2.0.2. It can be seen from the diagram below that routing speed with NAT is restricted to wire interfaces performance of the device. In Russia and on the territory of ex-Soviet bloc countries PPTP still remains extremely popular method of connection to the Internet therefore we couldn't help but test DIR-809 performance by operation with this tunneling protocol. To our regret, the encrypted tunnels aren't supported. We tried to turn on PPTP together with MPPE, the tunnel was established, but right there broken, - no data were transferred through it. It is time to test the wireless module. In 2.4 GHz frequency range DIR-809 can operate in two modes: with enabled and disabled 20/40 MHz channels coexistence. We have tested the performance of the device during operation in both modes. Performance DIR-809 with disabled 20/40 customers support was expectedly higher. Also we measured transmission speeds of user data in case of connection of the client to a 5 GHz wireless network. At first we used one wired client for this test. From the diagram above it is visible that the received speeds are restricted to wired interfaces’ performance of the router. We decided to alter the test a little bit, by connecting the second wired client. On the diagram below maximum transmission speeds of user data of the wireless client in the 5 GHz range by operation with two wired clients are presented. Data received pointed out that wired interfaces of DIR-809 are a device bottleneck. To be fair, it is worth marking that we took measurements in situation of rather close lay-out of wireless devices. When moving away the wireless client from the router the speed of wireless connection will decrease, equalizing wired and wireless throughput. D-Link DIR-809 can work not only in the wireless router mode, but also perform functions of the repeater. Naturally, we couldn't but test operation in this mode. D-Link DIR-809 can extend wireless network only in other frequency range that is if the initial network worked in the range of 2.4 GHz, then DIR-809 will expand its covering only at a frequency of 5 GHz. In this test DIR-809 increased a covering of the network created by ASUS RT-AC88U wireless router, review of which will appear on our website in the near future. Another useful function of DIR-809 is the possibility of rate-limiting of the user traffic. For this experiment we used a UDP stream instead of TCP connections. Results of measurements are given on the diagram below. Practically on all of the speed ranges the rate-limit mechanism works correctly, however on very small speeds the considerable errors are possible. We decided to provide the separate diagram for speeds up to 4 Mbps. Also it is necessary to note that we couldn't force this mechanism to work for the outgoing traffic, so rate-limiting works only for incoming packets. On the announcement of the vendor D-Link DIR-809 wireless router supports the IPv6 protocol, however, to our regret, we couldn't force the device to transfer IPv6 packets. In conclusion we would like to note that during testing the case of D-Link DIR-809 wireless router didn't heat up more than 38,2 degrees Celsius while average temperature in the room was equal to 23 degrees Celsius. Measurements were taken by means of our laboratory pyrometer ADA TempPro-2200. D-Link DIR-809 is an inexpensive low-end wireless router which will suit those who wish to lower ones costs or aren't ready to overpay for not used functions of high-end models. The routing speeds provided by the device don't allow calling D-Link DIR-809 the high-performance top router today. However, to most of the users wishing to update the network equipment and get support of both frequency ranges them will be quite enough. A number of features of the device associated with the way we have received the equipment. These features are, for example, power supply unit which plug is not accepted by sockets in Russia. Or initial language of the web-interface. However we decided not to refer these features to drawbacks of the model. The strength areas of D-Link DIR-809 wireless router are presented below. Unfortunately, we cannot help but mention some of its drawbacks, which aren't depending on the place of acquisition of the equipment. Impossibility to rate-limit outgoing traffic. As of when this article was being written, the price for D-Link DIR-809 wireless router in online store GearBest was about 30 dollars, and the best price for D-Link DIR-809 in German-speaking Europe countries, according to website Geizhals Preisvergleich, was 139 euro. Currently our test lab is hosting two wireless router by ASUS meant for operation in LTE mobile operator networks: 4G-AC55U and 4G-N12. Today we're going to review the more entry-level model of the two, ASUS 4G-N12 wireless router, which features four Fast Ethernet ports and a wireless module with N300 support. However, let's take our time and tell you about everything in parts. ASUS 4G-N12 wireless router comes in a black plastic case with the dimensions of 175x125x30mm and the weight of only 300 grams. The device needs an external power adapter with the following characteristics (included in the box) for proper functioning: 12V and 1А. A considerable part of the front panel of the router is glossy. On the right part of the front panel there are LEDs that indicate operation of the device essential components: the wireless module and wired interfaces as well as LEDs indicating presence of the installed SIM card and connection to the WAN. LTE LED displays the power of the mobile service provider signal in the area where the device is located. The side panels of the case feature a slot for the SIM card and WPS button that is used for facilitation of wireless clients connection. It's worth noticing that 4G-N12 supports only full-sized miniSIM cards. MicroSIM and nanoSIM cards can be installed only using a special-purpose adapter. The upper panel is not remarkable at all and there is only a ventilation grate on it. The router under review has two external non-detachable antennas for the Wi-Fi network and two internal antennas used for connection to mobile networks. External antennas are fastened to the rear part of the device case. Also, there are four wired Fast Ethernet LAN ports located over here; one of them may be used as a WAN port if it's necessary to get connected to networks of wired service providers. A power socket, ON/OFF button, sunken Reset button, and a sticker with brief information about the device are located here too. The bottom part of the device has two round rubber legs and a small plastic stand meant for improved comfort in desktop mounting. Now let's have a look at the insides of the case. Hardware stuffing of ASUS 4G-N12 4G wireless router is two green textolite cards: a motherboard and wireless module used for connection to mobile service providers. Unfortunately, all primary elements are covered with metal screens. Only Broadcom BCM5358UB0 chip, which performs SoC CPU functions with support of 4G networks, is accessible. That is where we bring a very brief device hardware review to a conclusion and pass on to examining capabilities of its software component. Firmware upgrade is carried out in Firmware Upgrade tab, Administration menu item. Currently the firmware may only be upgraded in manual mode. In order to do this one will need to predownload the firmware file from the vendor's website. The whole firmware upgrade process takes around one and a half minute and does not require any technical proficiency from the administrator. That is where we bring a brief review of the firmware upgrade process of the device to a conclusion and pass on to examining capabilities of the wireless router web-interface. The web-interface of 4G-N12 4G wireless router is similar to other wireless telecommunications equipment by ASUS and therefore we will not review all of its capabilities in detail but only focus on the newest and most interesting ones. The web-interface is available in 13 languages. A new group that has been added is called SMS and one can use its tabs to send, receive, and edit text messages. Phone Book tab lets the user save phone numbers of the most sought-after subscribers on the router. On the whole, tabs in Wireless menu group are traditional and feature the same data as in other wireless routers by ASUS. Probably the only thing that we'd like to point out is inability to manually set the bandwidth of the Wi-Fi wireless channel to 40 MHz using current firmware. LAN menu item is used to specify the IP-address of the router LAN port as well as configure the operation parameters of DHCP. One of the most interesting menu items is WAN. ASUS 4G-N12 wireless router can get connected both to the wired service providers and wireless networks of mobile service providers. Selection of the connection type is made using Internet Connection tab. Unfortunately, connection methods popular in ex-Soviet bloc countries like PPTP and L2TP are not supported at the moment. One can choose only PPPoE as well as static or dynamic IP-address. Mobile Connection Status tab shows the parameters of the current connection to the mobile service provider network as well as allows managing traffic limits. One can choose the mobile network generation using which the connection should be established via Mobile Connection Scan tab. Also, one can select the service provider that one needs to connect to. Virtual Server/Port Forwarding tab lets the user manage the rule for PAT that allows remote users to gain access to a certain LAN resource. Intrusion Detection tab in Firewall menu item lets one carry out a thorough scanning of the transmitted packets for certain network services. Managing access to the WAN resources can be scheduled. The appropriate settings are available in Access Control and Schedule Rule tabs. Another interesting capability that is worth reviewing is WAN Capture in Network Tools menu item, which lets save packets that are transmitted via the device WAN interface. The file is saved in a format supported by the majority of modern traffic analyzers. 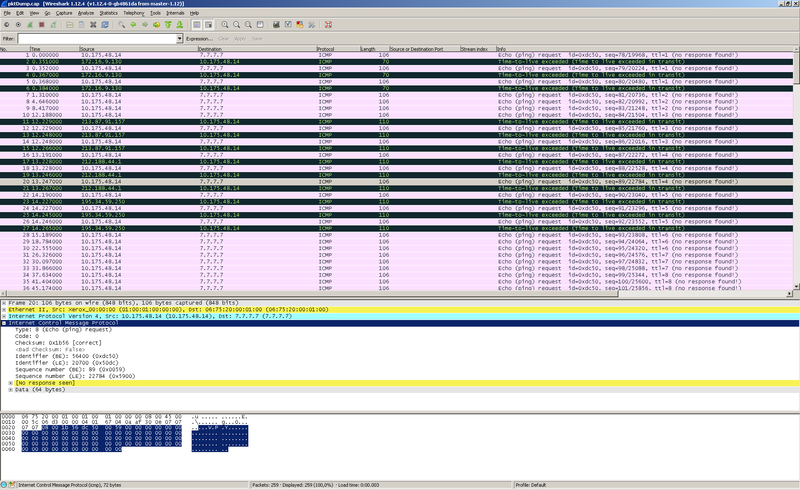 For example, it can be opened using Wireshark. It'd be fair to mention that 4G-N12 cannot be detected using standard ASUS – Device Discovery wireless equipment detection software because it may not be a proprietary ASUS device but a platform that has been ordered from third-party vendors like in the case of SL series routers. Also, getting connected to the device using Telnet and SSH protocols is impossible. That is why we are bringing this review of the device web-interface capabilities to a conclusion and pass directly on to testing it. The first testing procedure we usually begin our testing section with is estimating the booting time of the device, which is a time interval starting with the moment when the power is on until the first echo reply is received through ICMP protocol. ASUS 4G-N12 wireless router boots in 29 seconds and we think it's a decent result. The second traditional test was a security scanning procedure, which has been carried out using Positive Technologies XSpider 7.7 (Demo build 3100) utility from the local network. On the whole, there were two open ports discovered, and they are TCP-80 (HTTP) and TCP-8085 (HTTP). At first we measured the data transmission speed between the wired and wireless clients. In order to test it we used JPERF utility, 2.0.2 version. Results of the measurements are presented on the diagram below. It's worth mentioning that the obtained values are due to the maximum connection speed of the wireless client. And though 4G-N12 router has N300 module, the connection speed didn't exceed 144 Mbps. It's possible that this happened due to the inability to set the bandwidth of 40 MHz. Perhaps when the vendor adds the above-mentioned setting, we will be able to obtain higher speed values. However, even in this case we would not expect it to improve performance significantly since it would be limited by Fast Ethernet wired interfaces. The second throughput test was setting of the maximum user data transmission speeds with enabled NAT/PAT. In other words, one of the four wired ports was used as the WAN interface. The obtained results are decent when it comes to one-way only operation, but we expected the speeds to be higher in full-duplex operation. Neither could we keep away from reviewing connection to the LTE network of the mobile service providers. At this stage we would like to point out that the received speeds will depend not only on the mobile service provider and the load of its network, but also on the proximity of the mobile phone tower to the device. Results of our measurements performed in one of the towns in Moscow region, far away from mobile phone towers, are presented below. ASUS 4G-N12 wireless router used for operation in LTE networks of the mobile service providers made a good impression on us. We believe that this device would become the workhorse for many home and small office users that experience problems with or have no connection to wired service providers. 4G-N12 will allow for provision of access to the WAN for all wired devices as well as wireless employees and customers. Connection settings are really easy and do not require any kind of special technical know-how. We hope that at the time when the device is on sale, the price will be competitive enough so that all interested users can afford it. The strength areas of ASUS 4G-N12 wireless router are presented below. Unfortunately, we cannot help to mention certain drawbacks of the model. As of this writing, the best price for ASUS 4G-N12 in German-speaking Europe countries, according to website Geizhals Preisvergleich, was 139 euro. The Chinese company netis SYSTEMS, a part of the group of companies NETCORE GROUP, has quite recently begun expansion on the Russian market of the network equipment. To admit, earlier we had no experience with the equipment of this vendor therefore today's review of netis WF2681 wireless router will be not only the description of concrete model, but also the acquaintance to the vendor in general. Let's get started! netis Beacon AC1200 wireless gaming router comes in a red plastic case with a white stripe on the sides. The device is meant for wall or desk mounting. The case has dimensions of 145x155x35 mm not considering the antennae and the stand with a mass equal to 285 g. To work properly the device needs an external power unit (included in the box) with the following characteristics: 12V and 1А. Minor scratches and attritions, if remain on the body, are almost not visible, but the fingerprints at the same time are very noticeable. Four non-detachable rotatable antennae with the gain ratio of 5 dBi are located on the upper panel of the case. On the front panel there are LEDs indicating the status and activity of wired and wireless interfaces of the router, as well as the status of WPS and power supply. The bottom panel is not remarkable at all, there are a ventilation grate located on it and four mounting holes used for secure the stand that props the case up so that it stays vertically. On one of the sides two T-shaped tooling holes used to mount the device on the wall are located. Also, a sticker with brief information about the device can be found over here. The rear side has five Gigabit Ethernet wire ports, a socket for a power adapter connection together with Default and WPS buttons located on it. Now let’s have a look at the insides of the case. The electronic stuffing of the model netis WF2681 is one green textolite card PB-7205-M04G-00 which has all essential elements located on one of its sides. The same card is used in another model - netis WF2780. Permanent fastening of antennae cables to the card is worth mentioning. In our opinion, it is not the best solution, however, for the end user usually it makes no difference. The system is powered by Realtek RTL8197DN SoC CPU that operates at 660 MHz frequency. We have already seen such kind of SoC CPU previously in router D-Link DIR-825AC, however there it has been used with radiator. Hopefully the active use of the model netis WF2681 will not lead to overheating of the chip. DDR2 RAM is presented by an ESMT module M14D5121632A with capacity of 64 Mbytes. The Realtek RTL8367RB chip is the managed L2 switch that has five Ethernet ports at 10/100/1000 Mbps. Support of the wireless network is performed by microchips Realtek RTL8812AR and RTL8192ER. That is where we bring the review of the hardware platform of the device to a conclusion and pass on to examining capabilities of its software component. Firmware upgrade is carried out in Firmware Upgrade item of System Tools group in advanced mode menu. In order to upgrade the firmware it is only required to select the file with the new firmware version preliminary downloaded from the vendor’s website and click on Upgrade button. The whole firmware upgrade process takes about three minutes (not considering the time required for downloading firmware from the vendor’s website) and does not require any technical proficiency from an administrator. Although the Russian-language version of the website may initially discourage some inexperienced users. Here, perhaps, it is worth noting that we are somewhat surprised that the firmware for the model netis WF2681 has not been updated for about a year and a half. One can make sure that the firmware update has been executed successfully at any page of the advanced mode menu - information on the current firmware version number is displayed in the upper right corner of the page. It is worth mentioning that when this article was almost finished, we have received a new firmware version from the vendor that supports Russian language, therefore for later use we will review the updated version. At the time of the publication of this article the new firmware has become already available on the website for downloading. Also the vendor plans to preinstall the new version of the firmware on all routers of this model sold in the Russian Federation. Complete with netis WF2681 wireless router the software allowing to prioritize a game traffic is delivered. The client part installed on the user's PC reports to a router which traffic should be given priority in case of congestion. Now let's pass on to reviewing of the device web-interface. Any modern web-browser may be used in order to access netis WF2681 wireless router’s web-interface. LAN port address is 192.168.1.1 by default. Quick Setup page, which is home page, allows the user to change parameters of a wireless network and type of connection to ISP. All other parameters of router functions are available in the advanced mode. Status item contains brief information about wired and wireless interfaces of the device. WAN Item of Network group allows the user to select the type of connection to the ISP. Connection to both wired and wireless operators is acceptable. Access to advanced settings is available by using the Advanced button. Settings of LAN interface are located in Network group. Address Reservation item is responsible for static IP binding for the definite client. Unfortunately we haven’t found the opportunity to set up IPv6. IPTV item of the same group allows one to set up connection of set-top boxes, working with IPTV. The model WF2681 can work in one of two modes: router and bridge. The choice of the mode is made by Operation mode tab. Management of the wireless network is performed by the items of the Wireless 2.4G and Wireless 5G groups. The settings responsible for quality of service are placed in QOS group. If the administrator needs access from outside to local servers, the Forwarding group will come in handy. Management of the access is done using items of Access Control group. DDNS item will be much required in case the ISP offers its users only dynamic IP addresses. Appropriate setting is available at Dynamic DNS item. At the moment only two DDNS providers: No-IP and Dyndns are supported at the WF2681 model. Let’s have a look at Advanced group which lets to enable or disable IGMP support (version of the protocol is not configurable), select the tunnel protocols, traffic from which will be allowed to pass through the router; enable WoL function (Wake On LAN), set up static routing and select the WAN-port speed. Management of the user’s settings, firmware upgrade, time settings, diagnostic tools and system log are collected in System Tools group. That is where we bring review of netis WF2681 wireless router web-interface to a conclusion and pass on to examining the capabilities of its command line. In order to access the command line one needs to use the same login and password as for the connection to the device web-interface. Here it should be noted separately that disabling of Telnet-access to the device using web-interface is not possible, however connection becomes possible only after the administrator enters login and password on the Password item at System Tools group using web-interface. We also found that though user password setting opens access to command line of the device it also makes web-interface more inaccessible. Naturally, we notified the vendor about this and are expecting this problem to be fixed in the next firmware versions. Firmware of the model under review is built on Linux 2.6.30.9 OS using BusyBox1.00-pre8. Let's see what processes are currently running using ps command. Top utility is unfortunately absent. We present the contents of the catalogues /bin, /sbin, /usr/bin and /usr/sbin in a separate file. A couple of files in /var catalogue have focused our attention: passwd and passwd.telnetd. Both of these files contain the administrator login and password in plain text. Of course, it's not a very big problem, as to gain access to these files one needs to know the administrator password, but together with a standard password for wireless network makes us assume that the vendor engineers are not paying attention to security issues. And, of course, it is also kept in mind that two years ago in netis router firmware there was discovered a built-in easily exploited Trojan that used UDP port 53413, which was, it should be noted, quickly removed. That’s where we draw the brief review of the device command line interface to a close and pass on directly to testing it. The first traditional test we begin this part with is estimating the booting time of the device, which is a time interval starting with the moment when the power is on until the first echo reply is received through ICMP. Wireless router netis Beacon AC1200 boots in 31 seconds. We consider that it is a good result. The second no less than standard test is a security scanning procedure of the device, performing with the help of a security scanner Positive Technologies XSpider 7.8 (build 8.25.5.24075). The scanning has been carried out from the LAN. There were eight open ports discovered. The most interesting data of this test are presented below. The first performance test we carried out was measuring throughput of user traffic during NAT/PAT. In order to test the devices we used JPerf utility, 2.0.2 version. The tests were carried out with 1, 5 and 15 concurrent TCP sessions. During NAT/PAT testing router web-interface remained responsive and CPU utilization remained relatively low. Then we decided to measure user data transfer speeds via PPTP tunnels. Unfortunately, neither encryption nor data compression are supported. During this testing CPU utilization was near 100%, web-interface was not responsive to user activity, giving variety of errors. In order to measure wireless speeds netis E1+ repeater was used as a client within the frequency range of 2.4 GHz. Fast Ethernet interface became a bottleneck during this test, therefore we decided to repeat measurement and use standard ASUS PCE-AC68 NIC as a wireless client. As a result the speeds were significantly higher. ASUS PCE-AC68 NIC was selected as a wireless client within the frequency range of 5 GHz. We made current measurement and both previous using WPA2-protected connections. We also noticed that the CPU utilization of the wireless router netis Beacon AC1200 was close to the maximum, so we decided to repeat the experiment leaving the wireless network open. No encryption of wireless networks reduced the load on the CPU a little bit, but no substantial speed growth was detected. Another function, by which we could not pass, is QoS. We decided to find out how the configured maximum speed value matches with the real measured. For testing we used ten concurrent TCP-connections. At the graph below one can see that the bandwidth limit works only to values of the range of 300 Mbps, a further increase in this value has no effect on the real speed. During our performance tests, the router case temperature didn't get higher than 41°С, the environment temperature was 23°С. We were left with mixed feelings after reviewing netis WF2681 wireless router. On one hand, netis Beacon AC1200 has features not implemented in many other competitors. On the other hand, some of our usual features are missing here. The device demonstrated speeds do not let one call the model WF2681 high-performance top-rated router. However, they will be sufficient to the majority of users who want to upgrade their network equipment and get support for both frequency ranges. Also it is worth noticing that this model is more than two years old. Therefore today, in our opinion, netis WF2681 wireless router will be interesting not to the gamers who are looking for maximum performance, but to common users. Among the strength areas of netis WF2681 wireless router are the following. Software that optimizes the transmission of gaming traffic. Unfortunately, we cannot help but mention some of its drawbacks. As of this writing, the best price for netis WF2681 wireless router in German-speaking Europoe countries, according to website http://geizhals.at/, was 58.49 euro.